even if you technically get the food delivered through Uber Eats! 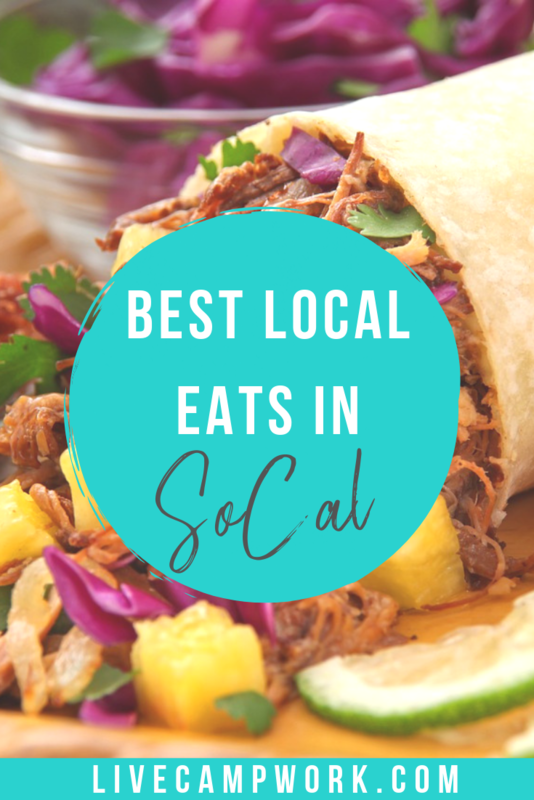 Tasting the local fair is always ranked high on our list, and since sometimes I really don’t feel like cooking… so spending some cash to support local businesses is the way to go! During our trip to San Diego, we ate a ton of local food. We just couldn’t get enough of it! We went out for Taco Tuesday, we ate by the water’s edge, around fire pits, in historic locations, onsite cafes, oceanside pizzerias, at museums, food trucks, food carts, and so many more! To choose the best one would be way too hard so I won’t try… but I’ll tell you my top 5 to help narrow it down send some love to the local spots we enjoyed the most during our stay. 1. Rockin’ Baja Lobster Catina: We love Mexican Food and the kids are cray about Tacos in particular- so we celebrate Taco Tuesday every week! After a few internet searches we found a ton of places who offer great Taco Tuesday Specials and decided to try out the Rockin’ Baja Lobster Catina in Historic Old Town San Diego! We noticed this place while eating at our #4 recommendation and were drawn into the tiki torches and possibility of eating around a fire pit table! We reserved the fire pit table through “Open Table” but unfortunately when we arrived the patio was closed due to wind so we sat inside. Word of Caution: The tacos are only $2 on Taco Tuesday but don’t expect them to be small… I ordered 3 different seafood tacos and that was a mistake! A delicious mistake. 2. The Crabby Patty: We wanted to dine at the seaport where it seems all the locals go for great seafood! Our two choices were the Crabby Patty and the Fish Market. The Fish Market was way overcrowded and seemed like the choice if you wanted to sit for a long while waiting for food and socialize in the meantime… we weren’t interested in being seen so we chose the Crabby Patty which was a bit less packed and offered great service. The kids were a little disappointed their were no mentions of Spongebob, but they did have a crabby patty which was a crab cake! The food was great, the staff was friendly and I had the clam chowder, which was on point! 4. Fire Pit Table in Old Town: During our first trip to Old Town, we spent too much time sightseeing and didn’t plan enough time to make it home for dinner. Everyone was getting antsy and Antwon was hangry- so we stopped at this cute little Mexican place right on the corner, because we saw people eating a fire pit tables while driving by. The kids were able to grab a fire pit table which only seated the 4 of them, and Antwon and I sat at a cocktail table by the window behind them. It was a good night with good food. The taco salad, enchiladas and tacos are all great grabs! 5. Seaport Village: If you go to San Diego, you have to go to the Seaport Village! It’s so cute, offers live entertainment by local entertainers (including a man who swallows fire and swords) and they have the 1/2 pints of beer for $7 a glass!!! Antwon thought I was crazy when I walked back to our table with this big momma, but I had to. Pizza, burgers and chili cheese fries were our choice picks for junk food and we had to stop by the Food Network Cupcake Wars champion bake shop and Ben & Jerry’s for ice-cream! Woop.